Massive sale includes the Pink Floyd legend’s iconic black Stratocaster. Legendary Pink Floyd guitarist and singer David Gilmour is putting numerous items from his personal guitar collection up for auction through Christie’s. The sale will take place in New York City on June 20, with all sales proceeds benefitting charitable causes. Estimates on the guitars range from $300 to $150,000. Comprising more than 120 guitars, the collection focuses on a selection of Fender Broadcasters, Esquires, Telecasters and Stratocasters. The sale will be the largest and most comprehensive collection of guitars to be offered at auction. For more details on the auction, look for an exclusive interview with Gilmour in the May 2019 issue of Guitar World. Gilmour's 1969 Black Fender Stratocaster, purchased in 1970 at Manny's on West 48th Street in New York City (Estimate $100,000-$150,000). ‘The Black Strat’ quickly became Gilmour’s primary performing and recording instrument for the next 15 years and it was extensively modified to accommodate his evolving style and performance requirements. The guitar was played on “Money,” “Shine On You Crazy Diamond” and the legendary solo on “Comfortably Numb.” It was key to the development of the Pink Floyd sound and was instrumental in the recording of landmark albums such as The Dark Side of the Moon (1973), Wish You Were Here (1975), Animals (1977) and The Wall (1979). 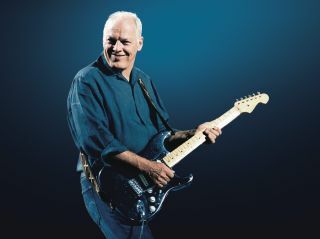 The guitar can also be heard on solo albums including David Gilmour (1978), About Face (1984), On An Island (2006) and Rattle That Lock (2015). Gilmour's 1954 White Fender Stratocaster #0001 (estimate: $100,000-$150,000). Gilmour used the guitar on “Another Brick In The Wall (Parts Two and Three),” as well as onstage. A rare Gretsch White Penguin 6134 purchased for Gilmour’s private collection (estimate: $100,000-$150,000). A Candy Apple Red 1984 Stratocaster 57V (estimate: $15,000-25,000), which became Gilmour’s primary electric guitar during the Eighties and Nineties, used during recording and touring of the Pink Floyd albums A Momentary Lapse of Reason (1987) and The Division Bell (1994). An early 1954 Stratocaster (estimate: $50,000-70,000), believed to be one of a group of Strats produced by Fender prior to its commercial production release in October 1954. A 1957 ‘Ex-Homer Haynes’ Stratocaster, with gold plated hardware and finished in the rare custom color of Lake Placid Blue (estimate: $60,000-90,000). A 1969 D-35 Martin purchased on the streets of New York in 1971, and used as both Pink Floyd and David Gilmour's main studio acoustic, notably on Wish You Were Here (estimate $10,000-20,000). A Gibson J-200 Celebrity (1985) acquired from John Illsley of Dire Straits (estimate $3,500-5,500). A unique Tony Zemaitis (1978) custom acoustic bass guitar (estimate $15,000-25,000). For more information on the auction, head over to Christie’s.